Earlier this week Mud opened one of the jars of Jalapenos I had pickled five weeks ago, to add to his Chicken Fajitas and declared them a success. He told me they were tasty and hot, better than the shop bought ones we spend a small fortune on each year. 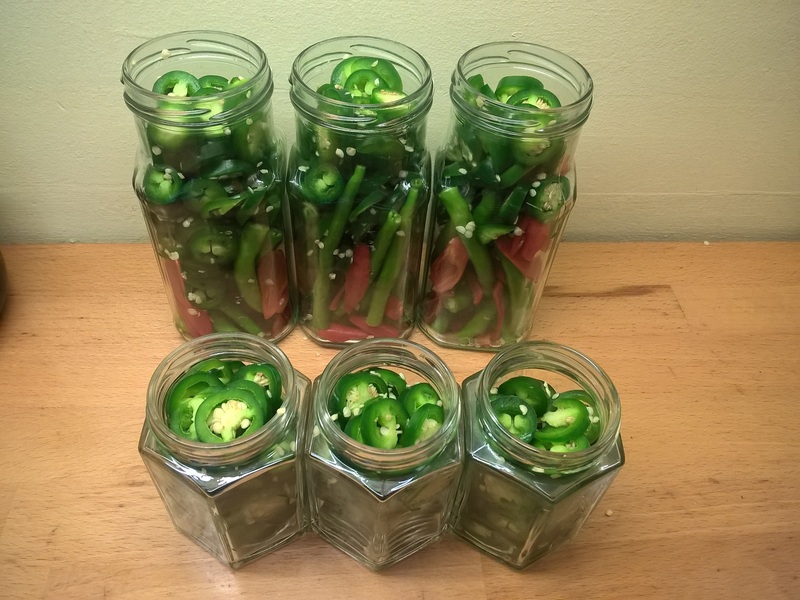 With lots of chillies still growing in the greenhouses, and handfuls of the incredibly successful Curry Chilli in the freezers, I decided to make a second batch of pickled Jalapenos. Prepped and ready for pickling. 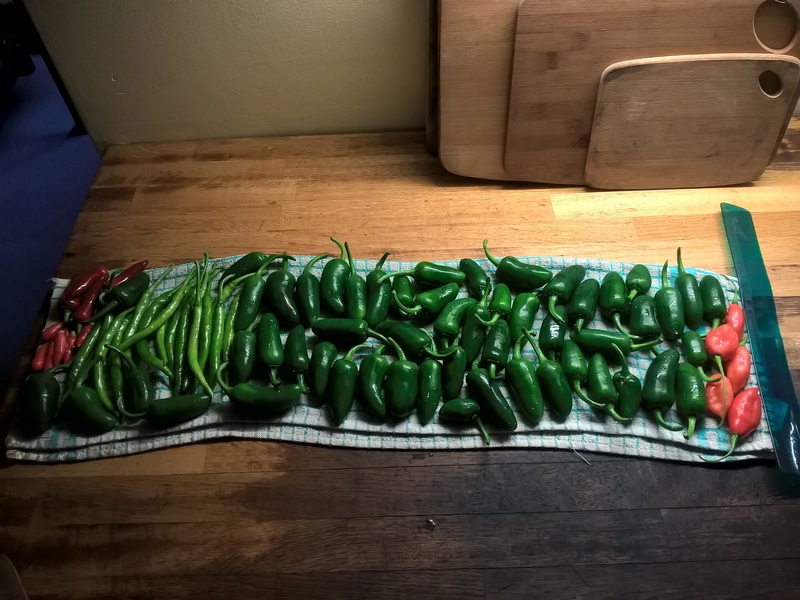 The stars of the show, the immensely prolific Jalapeno, were sliced into rings with the seeds intact. I added caster sugar, salt, Szechuan peppers, mustard seeds, bay leaves and garlic slithers to the vinegar which I set to simmer for 10 to 15 minutes, sterilised several jars including three tall, reclaimed curry sauce jars in which I wanted to create a mixed chilli pickle. 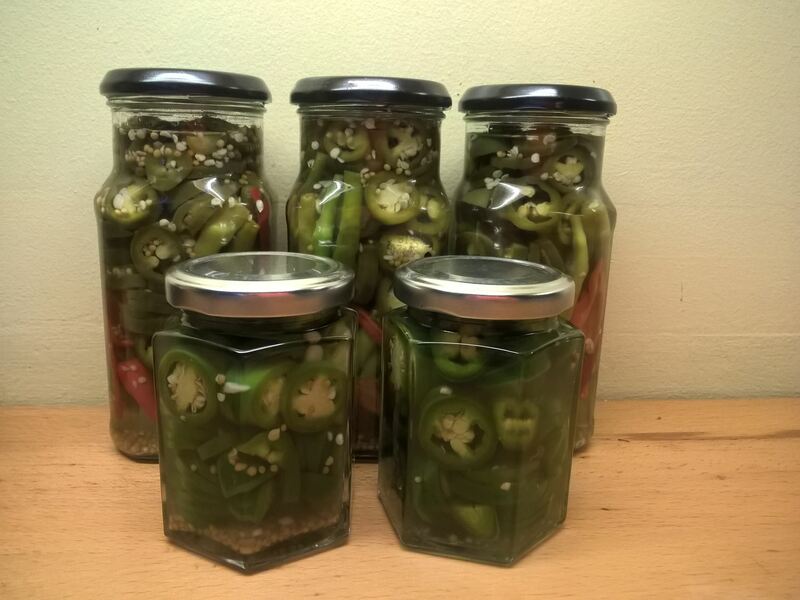 I split the non-Jalapeno chillies into three equal amounts and added them to the tall jars before packing sliced Jalapenos around them, cramming as many as possible into each jar. 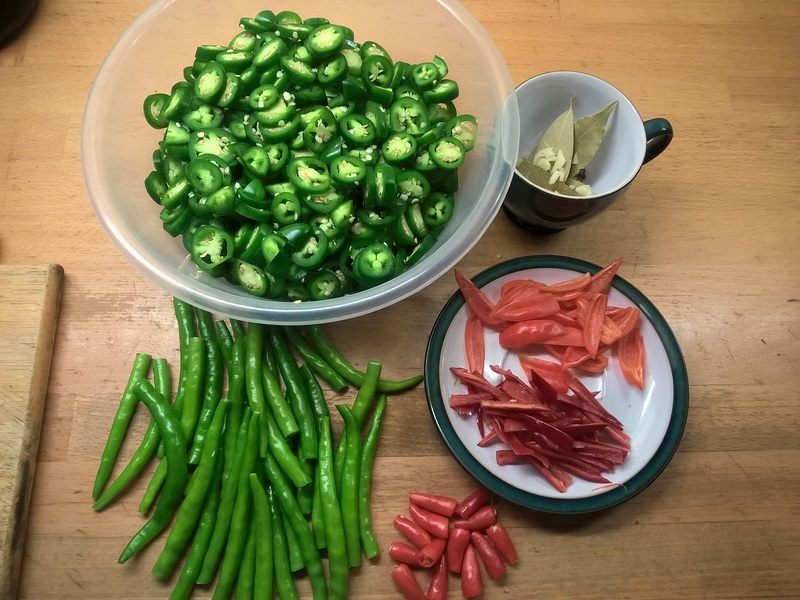 Most of the remaining Jalapeno rings were added to the three smaller jars but there were too many of them and so the remainder (approximately 100g) went into a bag and then into the freezer. … but I only had enough spiced vinegar for five of them! The hot vinegar mix was added to the jars – which was when I realised I didn’t have enough to fill the third of the small jars and so those chilli rings joined the ones in the freezer. As I type I can hear the jar lids pinging which is the security seal re-engaging, as the mixture in the jars cools down. It’s a satisfying sound but I won’t know how successful this pickling has been for at least another four weeks.